DESCRIPTION: Recently Remolded trailer on the inside, including furring out with 2X4's, insulating, new sheetrock, flooring, windows. Outside has new siding. 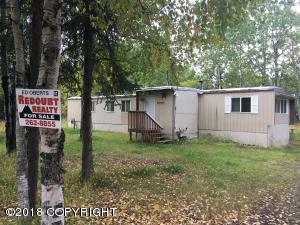 Great location in Sterling with public access to Kenai River at Morgan's Landing State Recreation Area. DRIVING DIRECTIONS: From Soldonta take the first entrance to Scout Lake Loop. Turn right onto Lou Morgan Road, then left onto Tallaric St. Watch for the sign on the right.